Reference number for this case: 27-sep-54-Breusy. Thank you for including this reference number in any correspondence with me regarding this case. Perpignan, October 1. -- At the mas of Bruzy, near Perpignan, several vintagers stated to have seen in the sky a brilliant object having the form of a saucer. After having moved verticaly while leaving a white trail, the craft disappeared in the clouds. In Mulhouse, two people stated to have seen a luminous machine in the sky of Rixheim, using binoculars, they noted that it had the shape of a long cigar, a dozen small satellites surrounded it. A railwayman on night duty stated to have observed the same phenomenon. In Bessegues, two residents of the commune of Foussignargues, close to Bessegues, stated to have seen in a meadow, near their house, in the night from Sunday to Monday, a sharp red luminous machine surrounded by vertical stems. In Nevers, Mr. Raymond Deloire, 20-year-old, farm labourer in Langeron (the Nièvre) who drove on the road of St Pierre les Moutiers, saw in the sky, a mysterious object of half-spherical shape emitting at its front a sharp orange gleam, flames spouted out at the back. The craft moved without noise at a great speed in the direction of the North-East. Stockholm. -- The "Bjuv meteor", photographed in the night of Monday to Tuesday by a resident of that city, was only a jet plane, the Swedish military headquarters estimated by examining the photograph of the craft. However, professor Bertil Lindblad, attached to the Lund observatory, after enlarging, had believed to detect a robot-weapon. Based on the direction taken by the object, one had thought that it could come from Eastern Germany where, according to certain information, the Russians would currently carry out rockets experiments. In addition, the "flying saucers" continue to be reported in the four corners of the sky of France. There is not a single day without witnesses in good faith see "mysterious machines" with weird shapes, and slipping by at great pace in an impressive silence. Near Perpignan, several vintagers stated to have seen in the sky a brilliant object having the shape of a saucer. After having moving at the vertical while leaving a white trail, the apparatus disappeared in the clouds. Two people stated to have seen a luminous craft in the night of Thursday to Friday, in Rixheim (Haut-Rhin). Using binoculars, they noted that it had the shape of a long cigar. A dozen small cigars surrounded it. A railwayman on night duty night stated to have observed the same phenomenon. Two residents of the commune of Foussignargues, close to Bessèges, saw in a meadow, near their house, in the night from Sunday to Monday, a sharp red luminous machine surrounded by vertical stems. in Pau, Thursday, many people saw in the sky, at very high altitude, a mysterious machine having the shape of a long and shining balloon. The machine came from the south and moved towards the North-West. Lastly, Mr. Raymond Deloire, aged 20, farm labourer in Langeron (the Nievre), who circulated the other night with a bicycle on the road of Saint-Pierre-le-Moutier, saw in the sky a mysterious object of half-spherical shape emitting with a sharp orange gleam at its front. Flames spouted out of the back. The craft moved without noise at a great speed in the direction of the North-East. Ufologist Aimé Michel notes that on September 27, 1954, in Breusy, which is located in the suburbs of the city of Perpignan, vintagers saw a circular object which arrived quickly, then went away into the clouds, out of sight. The website indicates that on 27 September 1954 in "Breusy, which is in the suburbs of Perpignan, vintagers see a circular object which arrives quickly then entered in the clouds, out of sight." The sources are indicated as: "Ovni, Premier dossier complet... par Figuet M./ Ruchon J.L. ** éd. Alain Lefeuvre 1979" et "M.O.C. par Michel Aimé ** Arthaud 1958". 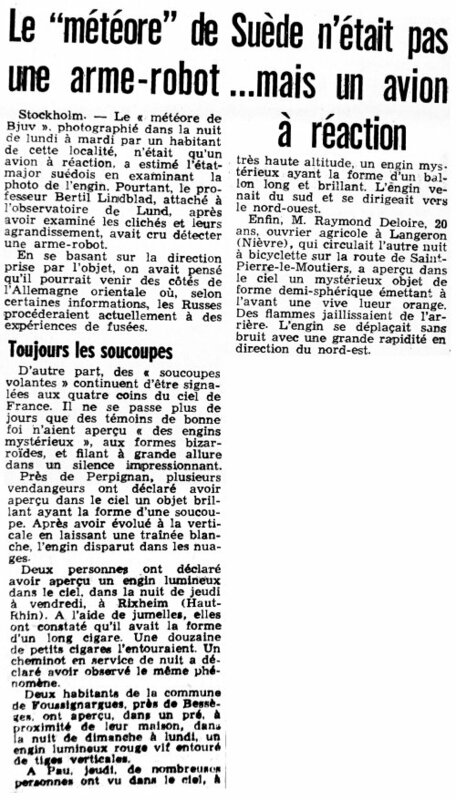 [vm1] Article in the regional newspaper Var-Matin République, Toulon, France, October 2, 1954. [le1] Article in the regional newspaper L'Est Républicain, France, October 3, 1954. [am1] "Mystérieux Objets Célestes", book by Aimé Michel, Seghers publisher, France, page 123, 1977. 1.0 Patrick Gross February 1, 2010 Conversion from HTML to XHTML Strict. First formal version. Additions [lc1]. 1.1 Patrick Gross February 25, 2010 Addition [vm1]. 1.2 Patrick Gross May 25, 2010 Addition [le1]. 1.3 Patrick Gross February 9, 2017 Addition [ub1].